Taipei, Taiwan (May 30, 2018) – ATEN International, the leading provider of IT connectivity and management solutions, will showcase the tangible advantages of its “AV Meets IT” strategy at COMPUTEX 2018. Connecting AV/IT for the world, this year the booth will highlight ATEN’s latest innovative solutions in five key areas – Control Rooms, Digital Signage, Collaborative Spaces, Server Rooms, and SOHO & Corporate environments – with a further focus on global customer success stories. As consumers and businesses are showing an insatiable demand for access to information, a dramatic acceleration of connectivity is under way. Network connected device types are multiplying; video walls continue to proliferate; 4K is becoming widely adopted; and AV and IT continue to converge. To accommodate these growing industry and customer demands, at COMPUTEX 2018 ATEN will present the tangible advantages of its AV/IT connectivity focus by demonstrating its Red Dot Award and 2018 COMPUTEX Best Award winning 4K over IP digital signage and control room solutions, powerful presentation and intuitive collaboration solutions, and next-generation docking station innovations. Control rooms are a fast-paced, high-pressure environment with a myriad of technological challenges. At COMPUTEX, ATEN will showcase the advanced KVM over IP Matrix System, an innovative solution that combines KE Series Extenders with the CCKM KE Matrix Management Software to extend, control and monitor access to computers across a network in a multitude of ways. One of the highlighted product series is the KE8952/KE8950 4K HDMI KVM over IP Extender, which offers high scalability and flexible deployment for different control room needs. Its centralized management functions and intuitive GUI greatly enhance management efficiency to allow users to effectively monitor multiple information streams to make accurate, mission-critical decisions. The key to a successful digital signage installation is the flexible and scalable distribution of A/V source content to multiple displays. The ATEN booth will showcase its VE8950 4K HDMI over IP Extender, which was recently honored by both a Red Dot Award and a 2018 COMPUTEX Best Choice Award for its human-centric design and effortless user experience. Designed to enable systems integrators to solve problems while creating solutions for large-scale digital signage and video wall deployments covering hundreds of meters via daisy chain, it offers decentralized management for system control from anywhere. In today’s corporate climate, clear and efficient communication is an essential competitive advantage. At COMPUTEX 2018 ATEN will feature its 7 x 3 Presentation Matrix Switch, the VP2730, which enables an intuitive connection experience by providing Seamless SwitchTM Technology and multi-format inputs and outputs. With advanced meeting management functionality, VP2730 allows users to effortlessly control displays remotely for any sized meeting room environment. By facilitating sharing and collaboration with no distance limitations, the VP2730 encourages and augments the meeting and presentation activities that are crucial to success in today's information-centric global business world. In the rapidly-evolving data-hungry IT environment, data center management is becoming increasingly intensive and complex. ATEN will display its wide range of data center KVM solutions that offer convenient, flexible, centralized remote access and management of IT devices in multiple data centers and distributed branch/remote offices. In addition, as a company committed to pursuing sustainable development, ATEN will showcase its Green Energy solutions, including eco DC energy & DCIM management software, the new OL1000LV Professional On-Line UPS and RE42U100 standing server racks for optimizing data center management and energy usage. In addition to 4K device control and connectivity, ATEN also offers a truly immersive next-generation visual experience with amazing throughput speeds, and will demonstrate its latest ThunderboltTM 3 docking station, the UH7230. The UH7230 multiport dock allows connection via two 4K displays (one DisplayPort and one Thunderbolt™ 3 USB-C port) or one latest generation 5K display, with nearly 16 million more pixels than an HDTV. To meet the increasing demand of higher video quality and transfer speeds on modern computers, ATEN also presents the world’s first USB 3.0 4K DisplayPort MST KVMPTM Switch, the CS1922M. With a built-in MST hub, the CS1922M enables users to adopt two console displays from a single DisplayPort 1.2 video source, providing an extended desktop mode and splitter mode at a resolution up to 4K for multitasking across two displays while reducing bulky cable connections. With ergonomic design and advanced functionality, ATEN solutions are redefining desktop connectivity for maximum productivity and creativity. In addition, ATEN is proud to present its true 4K HDR Pro A/V, HDBaseT, and secure KVM products and solutions to demonstrate its wide range of product portfolios and capabilities for connecting AV/IT for the world. 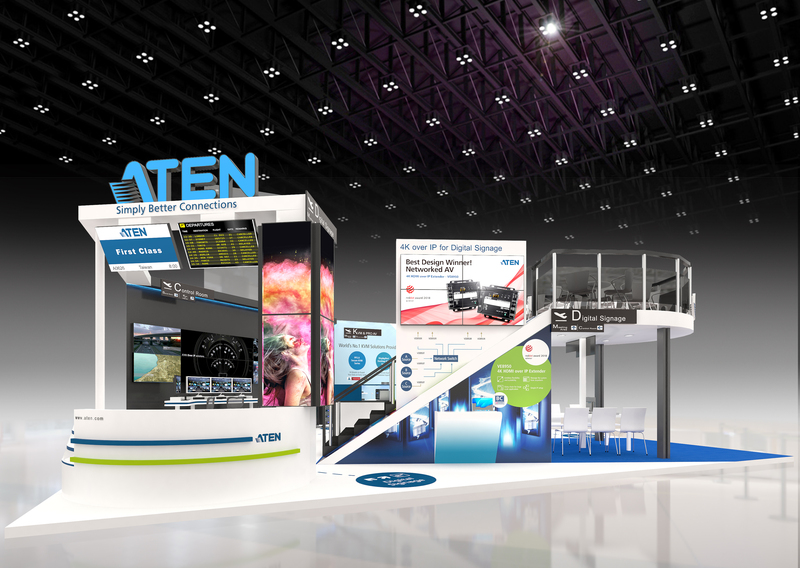 To learn more about ATEN products and solutions, please visit ATEN booth (A0626) at the Hall 1, Taipei World Trade Center from June 5-9.